Our Toastmasters Family is at a loss of one of our own selfless servant leaders. 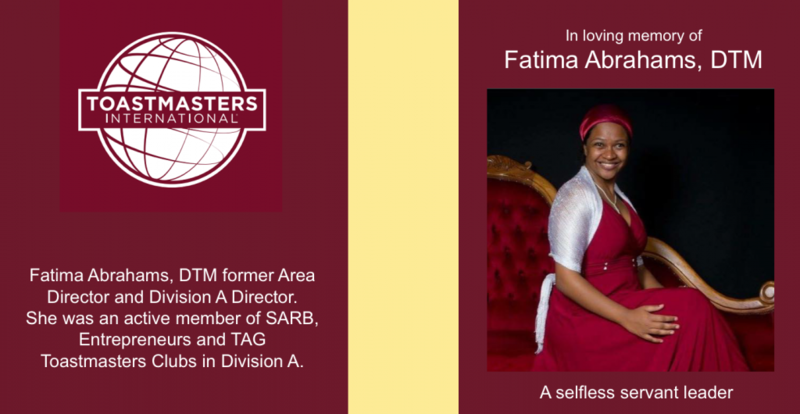 Fatima Abrahams, DTM collapsed and passed on Wednesday 19 September 2018 in the afternoon. Fatima had been an illustrious leader who served with respect and excellence as Area Director (2015, 2017, 2018) and Division A Director in 2015-2016. She will be laid to rest in Cape Town by her family on Thursday 20 September 2018. Further communication with regards to her tribute will be shared in due course.